1. Grab a hot chocolate, coffee, or your preferred caffeine stimulant. We said this was about creating a simple social media strategy, not that it wouldn’t take you some time (time well spent, might we add). This is the first thing you should do, and key to your overall marketing strategy. Really think about your ideal customer; how old are they, are they male or female, what does their family situation look like – married, divorced, single, kids?, where do they live, what do they do for fun? Once you’ve narrowed down who your target audience is, spend some time figuring out where they hang out online. There’s no point starting a company Twitter page or YouTube Channel, if your target customers are LinkedIn and Facebook kind of folks. Now that you know where your target audience hangs out, start following them on Twitter and liking their pages on Facebook. There’s already a conversation happening online about you or your industry, start tuning in to get an idea of what’s being said. Now that you’ve determine where your target market hangs out online, and listened in on what’s being said, you can begin creating and sharing content. This is the bread and butter of your online presence – post interesting content, and people will share it on Facebook and LinkedIn, RT it on Twitter, and +1 it on Google+. The more people that share your content, the more people see it, and the bigger your online presence becomes. Pay attention to patterns, if people respond really well to a particular style of post, for example, asking a question on Facebook, post like that more often. You’ve got a winner, engagement-wise. Make your website your online hub. When people visit your website, they should be able to see everywhere else you have a presence online. This means including a Facebook, Twitter, YouTube, etc, button at the top of each page of your website (or, at the least, on your homepage). Link these buttons to your social networks, and include an RSS feed button if you have a blog. While you’re at it, use the same color scheme and profile picture (your company logo) when you customize your account on each social network. This way people that visit your Facebook page or YouTube Channel will know right away that it’s your company. The easier you make it for people to find you online, the better. Ok, now that you have a simple social media strategy and your building a presence online, don’t let it fall to the wayside. The worst thing you can do is start a Facebook page or Twitter account, and then stop updating it. Potential customers who find you on these social networks may wonder whether you’re still around if you last posted four months ago. Social media is technically free, but it can take a lot of time. We recommend making a list of things you need to do every day to accomplish your goals online, and then stick to it. 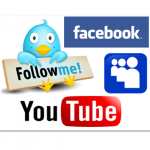 There you have it, a simple social media strategy to get you started online. This article was written by Corrie Scott, the Digital Marketing Manager at Out-Smarts Marketing. Corrie is a graduate of the Sauder School of Business at the University of British Columbia with an honours degree in Commerce. Her professional interests include marketing, economics, and law, and she has aspirations to pursue a joint MBA-Law degree.